Está na altura de começarmos a pensar na Primavera e por isso, que tal uns posts sobre as tendências para arrasar esta estação? Vamos começar pelos folhos! Estão por todo o lado. Não me lembro de nenhum outro ano em que os folhos estiverem tão in como agora. Principalmente em partes de cima, mas saias? Vestidos? Calças? Também há! A escolha é muita e o difícil é escolher qual levar! Estou a falhar nesta tendência, porque ainda não publiquei nenhum look com nenhuma peça semelhante, mas me aguardem sim? Ela já cá está por casa, mas há outra mega esgotada no site da Zara com folhos nas mangas toda branca que se alguém a vir por aí apite está bom? Gostava de a ter por cá também! O que acham desta tendência? Sim? Não? Talvez? Ou passemos já à próxima por favor? It's time to start thinking about the new season and what are the best trends to rock in Spring! So? Let's start with ruffles shall we? There are everywhere! I don't remember to see them that much before like I see now! There are so in! Mostly on tops but skirts? Dresses? Trousers? You can bet you will find them there too! There is a lot to pick and the most difficult part is to choose from where to start! Personally, I love this trend on shirts. 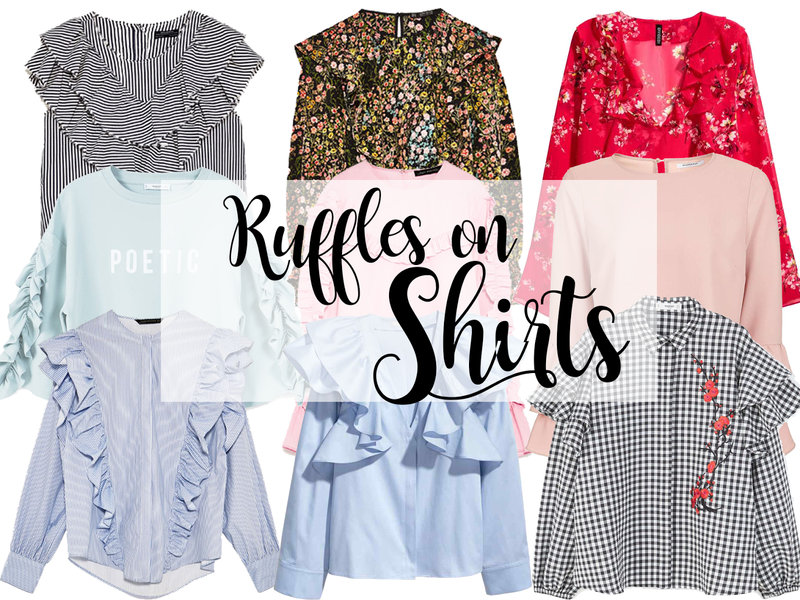 Okay, I'm a little bit suspect because I love a good shirt, especially if they have pretty details like ruffles that can make a whole difference in a look right? So, today I show you some of the shirts that I've been seeing on stores lately and I've been loving! Well, I can tell you that you'll see me a lot with this trend in spring! What do you think about this trend? Do you love it? Yes? No? Tell me everything! Ai meu deus, cada uma mais bonita do que a outra! Uma tendência que eu A-DO-RO! Aiiii que coisas mais lindas!!! AMEI Adriana!! Ruffles are one of my favorite trends and I hope they stay around for a while! This trend is so adorable! I actually just ordered some ruffle tops!